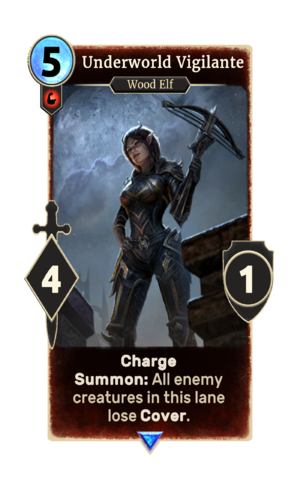 Underworld Vigilante is a rare Strength creature card. It is part of the Dark Brotherhood story set. It is available in Bravil. A playset of the card is awarded for completing Night Mother's Crypt. The premium version can only be obtained by soul-summoning, which is only possible after the completion of Night Mother's Crypt. "There's nowhere they can hide." "The hunter becomes the hunted!" This page was last modified on 27 February 2019, at 21:37.